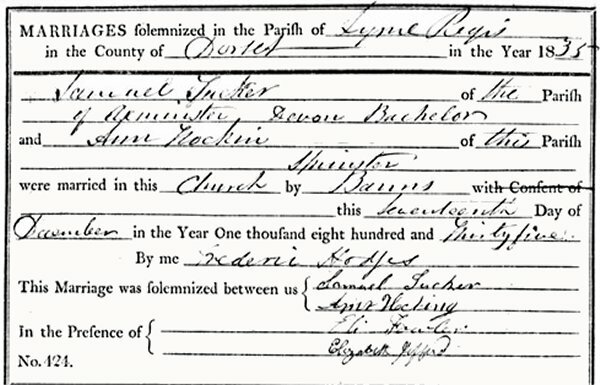 Samuel Tucker Was born to March 1812 at Northleigh, Devon, the youngest of the nine children of agricultural labourer James Tucker (1771-1851) and Mary née Bishop (1771-1861). By 1835 Samuel was living in Axminster, Devon and on 17 December that year, at Lyme Regis, Samuel married Ann Hocking of Axminster. Both Samuel and Ann were able to add their signatures to the marriage certificate. Samuel and Ann were to have nine children; Elizabeth born 1838, Samuel born 1840, Emmanuel born 1842, John born 1844, William born 1847, Mary Jane born 1848, Henry born 1850, James born 1852 and William Jewett born 1854. At the time of the 1841 census Samuel and Ann, together with their two children, were living at Pursebrook, Axminster. Samuel listed his occupation as a smith. By the time of the 1851 census Samuel had moved his family (now seven children) to South Street, Axminster where he gave his occupation as a whitesmith. In 1861 the family were still in South Street but sons Samuel and William were also listed as whitesmiths, presumably working with their father. By 1871 Samuel and Ann, together with their children Mary, Henry and James, had moved to Yeovil and were living at Rustywell. Samuel listed his occupation as blacksmith while Mary listed hers as a dressmaker, Henry was a glover while James was a carpenter. It was, perhaps, whilst living between these two pubs that Samuel became a member of the temperance movement known as the International Organisation of Good Templars (IOGT). The IOGT originated as one of a number of fraternal organizations for temperance or total abstinence founded in the nineteenth century and with a structure modeled on Freemasonry, using similar ritual and regalia as seen in the photograph of 'Brother' Samuel above, photographed in 1901 when he was aged 90. In the 1891 census Samuel, Ann and Mary were still in the same house but 79-year old Samuel listed his occupation as a blacksmith once again. in the 1901 census Samuel, now aged 89, listed his occupation as a blacksmith working at home. Ann died in the spring of 1903 aged 92. She and Samuel had been married for 68 years! Samuel Tucker died in the spring of 1905, aged 95. Samuel and Ann's marriage entry. 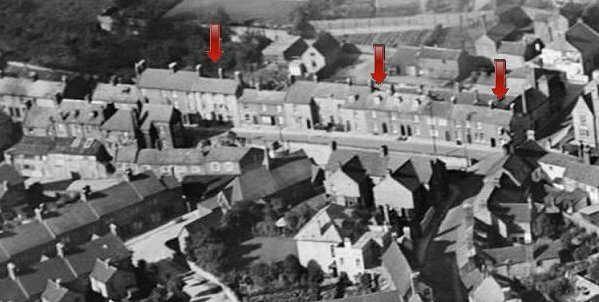 An aerial photograph of the northern end of Park Street showing (arrowed, left to right) the Rifleman's Arms, Samuel Tucker's house and the Globe Inn. 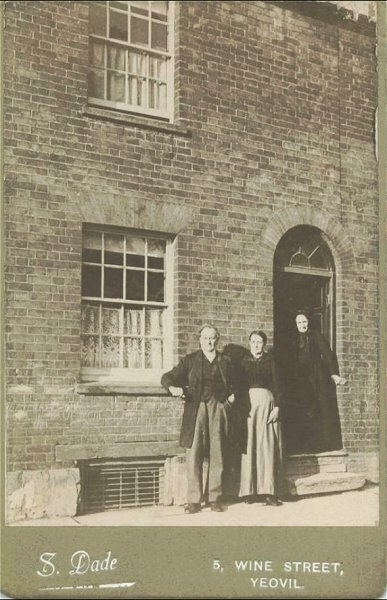 A photograph, probably taken in the 1880s outside their Park Street home, of Samuel Tucker, daughter Mary at centre and his wife Ann on the doorstep.